Mr. V.T. spotted this one, and I simply have to pass it along, because needless to say, it occasions some high octane speculation. For it's all about engineering the weather, you see, and that's a topic that has been and off-and-on subject of blogging and discussion here, both in vidchats and in the Dialogues, where one or the other of us occasionally brings it up. The subject intrigues me, because with the recent invention of "weather derivatives" added to the arsenal of financial schemes and scams of Mr. Globaloney, controlling the weather on which those derivatives are based would seem a surefire bet for some unique new twists on insider trading, especially since most people don't believe that humanity is capable of controlling the weather. The subject also intrigues me for a very different reason, and that's the technologies involved with it, which seem to me to increasingly substantiate the view that weather, and in particular major storms such as hurricanes and tornadoes, are fundamentally electromagnetically-based phenomena, and not the hot-air-got-trapped-by-cold-air sort of stuff we learned in school (that was back when they were still trying to teach something. OK, it may have been incorrect, but at least they were still trying). I, and many others who have researched the phenomenon of weather engineering far more deeply than I, have concluded that much of the spraying, or "chemtrails" as they are more popularly known, is designed in part at least for this purpose: the modification of the electrical conductive properties of the atmosphere for a variety of purposes: mind manipulation, weather control, and even in some cases, "Star Wars." These unique properties were recently exploited for investigating the capability of modulating some key atmospheric processes, like lightning from thunderclouds, water vapor condensation, fog formation and dissipation, and light scattering (albedo) from high altitude clouds for radiative forcing management. Let that one sink in for a moment, and then ponder the euphemistic end of the abstract, that they want to use "these new non-linear photonic catalysts for real scale weather control." Yes, I'd call "investigating" such "unique properties" for the possibility of having "the capability" to modulate "some key atmospheric processes, like lightning from thunderclouds" is quite a capability. In other words, imagine being able to steer lightning, to target it, via a plasma channel created by a charged laser beam, creating a columnated channel of charge differential for the lightning to travel on. Build up enough charge differential by some means - oh, I don't know, like HAARP or some other ionospheric heater - build up a massive charge, and then use a space-based laser to create a channel for that charge to discharge to the ground. To make the whole process more efficient, one could also increase the electrical conductivity of the medium (in this case the atmosphere) by - oh, I don't know - maybe spraying it with all sorts of electrically conductive heavy metal particulates. Sounds a bit like science fiction (and it is, of course, today's little bit of high octane speculation), and a bit like the ancient gods, like Zeus and Marduk, with their "thunderbolt" weapons. And if I can think of it, and you can think of it, rest assured, they can think of it and probably already have (funny how they seem to be building, piece by piece, the capability outlined above). And if such lightning bolt weapons seem to be "no big deal", look at the Valle Marineris on Mars, a vast scar running along the equator of the planet Mars, which some believe to have been caused precisely by such electrical arcing. Of course, some will tell you this was all just natural catastrophism created by an electrically dynamic solar system, when the planets were bunched up much closed together and electricity arced from one planet to another. But the same techniques I outlined above could be used just about anywhere, by anyone, "anywhen", who had the technology to engineer systems of a planetary scale. And we're doing it. What journal is this from? so terrific new world, they turn the atmosphere into a giant transisor (Jim Stone’s term).. implant thoughts into my head with 5g GRID and then zap me with lightning. memo to self: patent a protection umbrella and a GRID of earthing stations. (off topic, or not… todays comment was brought to you by the number 5 – high res of Saturns north pole hexagon. wow Doc, you summed up one great aggregation of technologies splained by any number of youtube channels and websites. DEW used in cali and greece for WILD fires that burn metal not wood? how many pages of other darpa based ideas? and commenters too. wasn’t stuxnet in fukushima’s systems before and during that tsunami? and wasn’t their security firm based in a small high tech weapons manufacturing nation in the middle east? might even have been the same company who ahem protected the wherled trade center in 2001.
sure would be cool to see some adults with better toys come into the room and calm things down a bit. keep thinking we’re gonna get our childhood’s end moment. Mere lightning bolts? Meh. Now how about channelling some of that ionospheric lightning downwards instead of up? Now we’re talking some serious teraforming!
. . . “Parity!”. . Parity is what most of this suggests to me in these last two entries,’ “Up there: France says Russia spying on its satellites; down here,” and this entry, “Of weather control & lasers & Marduk’s lightning bolts.” . .
. . . Parity of research and development of design technologies and innovation of industrialized nations on nearly all continents and a great deal of it through passive industrial espionage. . . Back engineering spin-off products. . . Some call it theft of intellectual property rights and subsequent exploitation of the markets. . .
. . . Couldn’t help but notice the name references used for the French Defense Minister, [Florence] Parly, and the impending Hurricane [Florence], heading towards the Carolinas. . . Coincidence suits me fine. . . Sure hope the nuclear power plants of the Carolinas are better prepared than Japan’s Fukushima units were after that Tsunami flooding. . . Storm surge and long term heavy rains can be just as inundating a water event as an earthquake generated Tsunami wave. . .
. . . The matter of electromagnetic (EM) energy pulse use for instigating weather phenomena would seem another item altogether, is NOT impossible, and is decades old, too, but the permutations of cause and effect seem far too great to tally for any terrestrial hominid genius or petaflopping super computers running scenarios toward predicting responsive moves and formulating back up plans, much less blame for the outcome – Not all EM sources are terrestrial as the Sol star is a primary contributor, of course, if not a major unpredictive one. . . RADAR units impose an energy quantity into the atmosphere with more subtle effects, just as well lit cities at night affect atmospheric breezes. . . Coal fired plants, vehicular fossil fuel emissions, point to point radio emissions, and wild fires do their share separately of disrupting the calculus as well as when lumped together. . . They’re also areas to hide, never mind the variations between industrialized nations with invested interests on land, in the air, in the seas, within the last century or so, now similar interests in space. . . To paraphrase an expression, “A tempest often begins far away with the fluttering wings of a butterfly.”. .
. . . This business of spying on the other guy’s spy and on spying contraptions could almost seem comical if it were not for extensive investments of all involved in nearly all aspects of the various nations socio-economic-industrial-military and commercial enterprises – was anything or anyone left out? . . Perhaps, the private, very private and separate enterprises not often mentioned. . . One could ask, “And, so, well, what now?”. . “Who’s whose fool for the day and for how many more?” . . “Does one play the game or learn first how to take punches?”. .
. . . Whether it’s the sovereign spy (agent to the sovereign) or the adversarial agent (spy to the adversary), tweaking or interfering with the others operation and gadgets, each are agents engaged in the daily chores of intelligence gathering upon the other to see what can be seen and done. . . Sometimes they reveal surprises not part of the discourse in the media just through their omissions. . . One should not leave out the treacherous who’ve had centuries to hone their deviance and pass it down to their successors and who now benefit by others being in conflict to which they supply each of the conflicted aggressors with finances, information (sometimes distorted), and a fervor to foster hostilities again and again they can only hope continue to become deep-rooted anxieties. . . In these instances, the world is more than a stage of acting, actors, and actresses toward roles of an activist. . . it seems to have been made a place to plunder by the ruthless. . . Thanks for the articles. . . They want to be gods but they have no idea what being human is how pathetic. “The people who hate this web site, which was the main whistleblower against Stuxnet type attacks on nuclear facilities, may have their dream approaching the East Coast – this fakely over-rated hurricane may all be a setup to justify making much of the United States uninhabitable. What would [be] worse than having a nuke plant explode during a hurricane, only to have the hurricane drag all that radiation deep into the United States? If they are going to cause a disaster in the middle of a hurricane, they HAVE TO prep the nuke facility with a hack beforehand; they HAVE TO pre-heat the reactors ahead of time because a hurricane does not last long enough for the whole process to carry out on time for the hurricane to carry the radiation inland. You took the words right out of my brain… the destruction that the powers that be keep saying how this hurricane is going to be, yet so far I have not heard one word of the nuclear power facilities that lay in the path of this storm. What happens if these facilities are destabilized by the storm…? Is it like what happened in Japan or would it be like Chernobyl? This storm & the timing of it which is right after 9/11 rememberance … weather modification to become another disaster… we have the fires still blazing in Northern Cali & now the mid-Atlantic states hunkering down, for possibly the worse flooding we will be seeing. Let’s see if I have this right. The US is modifying the weather using satellite based lasers, chemtrail spraying, and HAARP. Those I know of. Question #1. What is the reason for using lithium and barium in the chemtrails? How do those chemicals alter the weather? I can see how areosolized aluminum could alter the weather, but lithium and barium? Question #2. There is persistent speculation that they used HAARP to steer the hurricane into Puerto Rico and also to steer the hurricane into Houston and make it linger for days there. Will we see a repeat with hurricane Florence? Will it linger awhile over the Carolinas? Things are getting very spooky. you are able to breach in the era of data-based silos? Of course, “they’re” ionizing our skies via Chemtrails[invisible now/nanotech] with a multitude of nefarious purposes. Already they’re arguing about who gets to be Thor. Meanwhile the real asylum puppeteers are playing at gods of war eying Mars w/envy. But, hey, they’ve got Earth and many serfs to play with for now. plus, War is not only a real lot of fun, but hugely profitable in power, money & property. The only thing I’m surprised about is that this is being published, even though large scale weather manipulation is obvious for any sentient being able to lift their eyes from their phones and look at the sky (in other words, a mere handful of people). 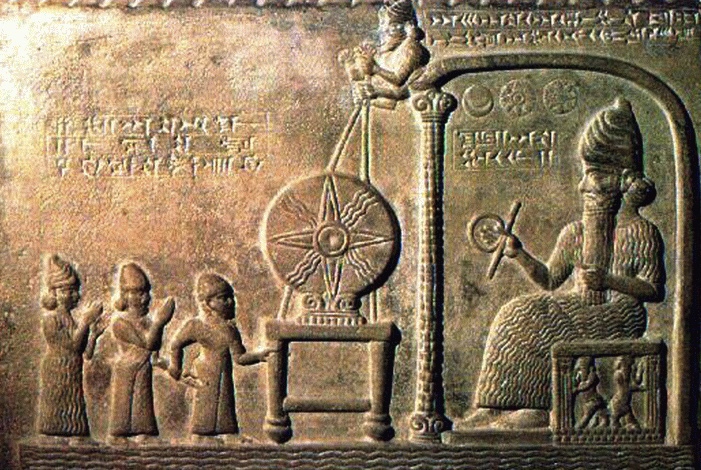 The Thunderbolt wasnt Marduk’s sign.. His sign was the Sirrush and the weird “circle with a rod” that was also Shamash’s favourite toy..I thought it might have been an early Ankh, with the rod hidden behind the hand.. but it wouldnt explain the Egyptians then holding it wrong later on.. The Thunderbolt was Enlil’s sign, carried on especially with Hadad (his grandson, born from Sin and Ningal) who inherited the Bull and the Thunderbolt from Enlil. Hadad/Iskur was also known as Baal-Zephon on his holy mountain at Ekron. He may have inspired the character of Zeus. A very interesting article indeed, Dr. Farrell needs contributions to his research fund to get past those peer-reviewed paywalls. And I have just finished a little molecular excitation myself with the explict aim of modulating organic compounds for subsequent chemical and physical transformation in a biological environment, i.e. cooked my lunch. Love it! I don’t laugh often enough these days. Thanks. Ever since Dr Joseph P Farrel educated me about the possibility of scalar weapons, I have been interested in ‘Space’ Weapons (pushed along by Dr Von Braun’s warnings against the weaponisation of Space..) so I have to admit.. I have a lot of information about ‘Pew-Pew’ weapons.. (and if people read the ancient texts.. those ‘God’ powers do sound a lot like an analogous explanation of the visual effects of ‘space weapons’… Check out what happened when Quezecoatl when menaced by the locals when he was walking about MesoAmerica (building temples..)… (he lifted his arms and everything around him was blown to pieces…) I keep referring to it.. but people need to read up on the Maurauder Project. GEORGE FISCHER… who currently works in laser development for the U.S. Army’s ARDEC. He is a founding member of Picatinny’s Armament Graduate School and has cotaught mathematics and probability courses there. He also worked at Bell Labs, where he characterized novel optical amplifier fibers and later developed all-optical switches for telecommunications at several start-ups. Dr. Fisher holds degrees from MIT and the University of Rochester, where his Ph.D. research was in nonlinear optics. (Pictanny Arsenal.. hmm.. sidenote : they’re slowing the SPEED OF LIGHT by passing electrical discharges through lasers…..I wonder if they need more Volts to really slow the light down…how many volts in lightening?? ONE BILLION??? (Dr Evil… A billion dollars…….) ok.. so that’s nothing compared to the power of MAN… right?? Van de Graaff generators produce the highest voltages. Charge is carried by an insulating belt from a lower electrode to another at the top, accumulating across a metallic dome. They can be strapped together to form tandems for even higher voltages. A tandem at Oak Ridge National Laboratory produced the highest ever at 25.5MV (a megavolt is 1 million volts).